Greetings, in Jesus' name. The last time I wrote to God's people on September 12, 2004 my wife Martha was six months pregnant. Today, almost a year later, Sept. 5, 2005, she is now in her eighteenth (18th) month of pregnancy. It is a miracle. It is a sign. The Lord spoke to me in the fall of 2003 and said, "The child is a sign of destruction, before the child is born there shall be destruction in America". This has been fulfilled as New Orleans, Mississippi, and Florida testify. We shall all perish, except we repent. God has resigned himself to destroy this nation, He has turned his back to forsake it. Only destruction and misery lie ahead. Back in the fall of 2004 God spoke to me that he was giving me three signs. The first sign was the child; the sign would be destruction before the birth. The second sign was that Florida would be ravished by the end of September 2004. The third sign was that Miami, Florida would be struck by a brutal blow from the hand of God. It would be overwhelming. Chaos, sorrow, devastation, death, destruction. He had me prophesy against the city. The first two signs have been fulfilled. Florida was ravished by hurricanes by the end of Sept. 2004. My wife is still with child today and destruction in America has happened in the form of Hurricane Katrina. New Orleans is gone. Mississippi destroyed. Soon Miami, Florida will be devastated. God has commanded me to warn all his people, Leave Miami, Florida! Flee out of Miami! New Orleans is your example that God will make waste an entire city. Oh people of God, hear the word of the Lord. I will cut off old and young. I will cut off man and woman. Your haughtiness shall be brought low. Shall be exalted in judgment. 18-Month Pregnancy: A Prophetic Sign? Before I begin telling this testimony of faith and of waiting upon the Lord, I would like to thank every one who prayed for me and this baby in Jesus' name. Back about a year or so now, I had asked for prayer for this baby from all my brothers and sisters in the Unleavened Bread study group. My brothers and sisters there and here have been so faithful to stand in the gap on my behalf while the Lord was teaching me to trust Him. May this glorify the Lord in us all in the days to come. (Lk.1:45) "And blessed [is] she that believed; for there shall be a fulfillment of the things which have been spoken to her from the Lord". (Mt.18:19) "Again I say unto you, that if two of you shall agree on earth as touching anything that they shall ask, it shall be done for them of my Father who is in heaven". Another week went by and no cycle, then another, then another. Not that I expected it, but the thought of being pregnant was still fairly new and the habit of checking for the cycle was not. One day I was at Meijers and I thought I should get a test. Then I thought, "But the LORD told me I was; what do I need a test for?" Then I thought to talk to the LORD. I said, "LORD I don't want to go to man or man's ways and act as though I don't believe You, so I need You to give me a sign, a sign that helps me stand on what You already told me. So I pray that You let my license, as I flip it down the aisle, land face up, letting me know that I am as You said I was--with baby". Now, I was fully prepared to trust the LORD in this, no matter what it said. (Ex. 4:8) "And it shall come to pass, if they will not believe thee, neither hearken to the voice of the first sign, that they will believe the voice of the latter sign". So I stood in the hallway of my home and flipped some coins and asked, that if it is still the same as it had appeared to me till then, let the coins flip heads up. (Pr.18:18) "The lot causeth contentions to cease, And parteth between the mighty". (Mk.4:40) "And he said unto them, Why are ye fearful? have ye not yet faith?" (Pr.16:9) "A man's heart deviseth his way; But Jehovah directeth his steps". (Mk.11:24) "Therefore I say unto you, All things whatsoever ye pray and ask for, believe that ye receive them, and ye shall have them". (Heb. 11:1) "Now faith is assurance of [things] hoped for, a conviction of things not seen". In my doubt I asked MANY "what ifs", only to discover that He began answering me according to what I was believing. I didn't see that that is what it was--yet. Afraid and lacking faith and confused, I called my sister in the Lord, crying. Many times the Lord has helped me though those who are trusting Him when I am struggling, too. She reminded me what He had said to me before, and told me that He longs for us to believe Him, no matter what it feels like, looks like, or sounds like. She reminded me of the Scriptures that tell of a man of God who was told (1 Kings 13:9) "[F]or so was it charged me by the word of Jehovah, saying, Thou shalt eat no bread, nor drink water, neither return by the way that thou camest". But he went back with a prophet that said (1 Kings 13:18 "[A]n angel spake unto me by the word of Jehovah, saying, Bring him back with thee into thy house, that he may eat bread and drink water. [But] he lied unto him". (19) So he went back with him and did eat bread in his house, and drank water". So because of his disobedience or unbelief of the Lord, he perished. (1 Pet.1:7) "[T]hat the proof of your faith, [being] more precious than gold that perisheth though it is proved by fire, may be found unto praise and glory and honor at the revelation of Jesus Christ". On the way home from the fourth-month visit, I talked to my sister, and she shared with me what she saw the LORD doing and I could see it. I became excited for my midwife, who was also having her faith tested and tried. I could see what was happening once again for a short time. (Ps.111:10) "The fear of Jehovah is the beginning of wisdom". (2 Cor.4:18) "[W]hile we look not at the things which are seen, but at the things which are not seen: for the things which are seen are temporal; but the things which are not seen are eternal". (2 Cor.4:13) "But having the same spirit of faith, according to that which is written, I believed, and therefore did I speak; we also believe, and therefore also we speak". I said to her the Bible says that He cannot lie: (Ps.119:89) "For ever, O Jehovah, Thy word is settled in heaven". (Ps.89:34) "My covenant will I not break, Nor alter the thing that is gone out of my lips". (Heb.6:18) "[I]t is impossible for God to lie". And that I walk by faith and not by sight. If the LORD said it, then He meant it, no matter what we can see. (2 Cor.5:7) "[F]or we walk by faith, not by sight". (Jas. 1:3) "[K]nowing that the proving of your faith worketh patience. (4) And let patience have [its] perfect work, that ye may be perfect and entire, lacking in nothing". (Mt.10:32) "Every one therefore who shall confess me (speak the same as me) before men, him will I also confess (speak the same) before my Father who is in heaven. (33) But whosoever shall deny me before men, him will I also deny before my Father who is in heaven". (Heb. 10:23) "[L]et us hold fast the confession of our hope that it waver not; for he is faithful that promised". (Rom. 1:17) "But the righteous shall live by faith". (Rom.10:10) "[F]or with the heart man believeth unto righteousness; and with the mouth confession is made unto salvation". (Gal. 2:20) "I have been crucified with Christ; and it is no longer I that live, but Christ liveth in me: and that [life] which I now live in the flesh I live in faith, [the faith] which is in the Son of God, who loved me, and gave himself up for me". I had struggled with double-mindedness--(Jas.4:7) "Be subject therefore unto God; but resist the devil, and he will flee from you. (8) Draw nigh to God, and he will draw nigh to you. Cleanse your hands, ye sinners; and purify your hearts, ye doubleminded. (9) Be afflicted, and mourn, and weep: let your laughter be turned to mourning, and your joy to heaviness. (10) Humble yourselves in the sight of the Lord, and he shall exalt you".--tempted often to believe man to make it easier on me, but I loved Him and I did believe Him, even when things from all directions would come to try to convince me otherwise. (Lk. 7:47) "Wherefore I say unto thee, Her sins, which are many, are forgiven; for she loved much: but to whom little is forgiven, [the same] loveth little". One day we found online at a midwifery site a testimony of Chantel's. It went like this. "The LORD told me that I was going to have more children. My husband and I have been trying for years. We began to go to fertility treatments with no success. One day we went and the doctor suggested removing my eggs and fertilizing them and then selecting the one that we wanted and discarding the rest. My husband took me aside and said, 'How far are we going to take this? Do you want a baby so bad that you would kill some of your children to have one?' She said she cried and said to him, 'Whatever you decide, that I will abide in no matter what it is'. He said to her, 'I think the LORD will do it the old fashioned way'. That night they went home and got pregnant--hallelujah! (2 Cor.10:4) "([F]or the weapons of our warfare are not of the flesh, but mighty before God to the casting down of strongholds), (5) casting down imaginations, and every high thing that is exalted against the knowledge of God, and bringing every thought into captivity to the obedience of Christ". (Lk. 12:48) "And to whomsoever much is given, of him shall much be required". (1 Chr.28:9) "[F]or Jehovah searcheth all hearts, and understandeth all the imaginations of the thoughts. If thou seek him, he will be found of thee". The storm of intrusive thoughts was unrelenting. Thoughts such as, "See, you're not pregnant; there's just something wrong with you", or, "Your baby's dead, that's why your labor has stopped", etc. As weeks went by, I was loosing hope. The baby moved within but it almost never seemed to be enough to hush the thoughts of, "What will people think?" I often heard, "People will think you are a liar". (2 Cor. 12:9) "[My] power is made perfect in weakness". (1 Cor.1:27) "[B]ut God chose the foolish things of the world, that he might put to shame them that are wise; and God chose the weak things of the world, that he might put to shame the things that are strong; (28) and the base things of the world, and the things that are despised, did God choose, [yea] and the things that are not, that he might bring to nought the things that are: (29) that no flesh should glory before God. (Phl.4:13) "I can do all things in him that strengtheneth me". (Mt. 17:20) "And he saith unto them, Because of your little faith: for verily I say unto you, If ye have faith as a grain of mustard seed, ye shall say unto this mountain, Remove hence to yonder place; and it shall remove; and nothing shall be impossible unto you". (Mt. 8:13) "And Jesus said unto the centurion, Go thy way; as thou hast believed, [so] be it done unto thee". (Mt. 9:22) "But Jesus turning and seeing her said, Daughter, be of good cheer; thy faith hath made thee whole". (Mt. 9:29) "Then touched he their eyes, saying, According to your faith be it done unto you". (Gal. 3:6) "Even as Abraham believed God, and it was reckoned unto him for righteousness". (Lk.22:31) "Simon, Simon, behold, Satan asked to have you, that he might sift you as wheat: (32) but I made supplication for thee, that thy faith fail not; and do thou, when once thou hast turned again, establish thy brethren". When I got there, I was surprised. Between the phone call and the moment I arrived to their home, they had been filled with faith. My brother Phil said to me things like, "Who's to say how long a person can be pregnant?" Phil often would hear the people at work talking about how I must not really have been pregnant way back then, or that I just must have been really wrong about the date we thought it was supposed to be. Phil quite faithfully stood in the gap and said to them, "All things are possible in Christ", and showed himself to be content and faithful to believe the Lord as well, despite how crazy it made him look to others.. Here in my thirteenth or fourteenth month, my Roy was really worrying. He wanted me to go to the doctor and, with tears in his eyes, he said to me that he did not want to lose me. I looked up to him and said, "Roy, I am not my own. I was bought with a price, and this baby is of the LORD and it's not for me to say what should or should not be done. I believe GOD, and GOD said to me, (Jn. 16:21) "A woman when she is in travail hath sorrow, because her hour is come: but when she is delivered of the child, she remembereth no more the anguish, for the joy that a man is born into the world". (Lk. 1:45) "And blessed [is] she that believed; for there shall be a fulfillment of the things which have been spoken to her from the Lord". (Jer. 30:14) "All thy lovers have forgotten thee; they seek thee not: for I have wounded thee with the wound of an enemy, with the chastisement of a cruel one, for the greatness of thine iniquity; because thy sins were increased. (15) Why criest thou for thy hurt? thy pain is incurable: for the greatness of thine iniquity, because thy sins were increased, I have done these things unto thee. (16) Therefore all they that devour thee shall be devoured; and all thine adversaries, every one of them, shall go into captivity; and they that despoil thee shall be a spoil, and all that prey upon thee will I give for a prey. (17) For I will restore health unto thee, and I will heal thee of thy wounds, saith Jehovah". --and I knew that I had to confess my impatience. (Mt. 24:13) "But he that endureth to the end, the same shall be saved". (2 Tim. 2:10) "Therefore I endure all things for the elect's sake, that they also may obtain the salvation which is in Christ Jesus with eternal glory". (1 Thes. 5:3) "When they are saying, Peace and safety, then sudden destruction cometh upon them, as travail upon a woman with child; and they shall in no wise escape". (John 16:21) "A woman when she is in travail hath sorrow, because her hour is come: but when she is delivered of the child, she remembereth no more the anguish, for joy that a man is born into the world". (Ps.34:17) "[The righteous] cried, and Jehovah heard, And delivered them out of all their troubles. (18) Jehovah is nigh unto them that are of a broken heart, and saveth such as are of a contrite spirit. (19) Many are the afflictions of the righteous; but Jehovah delivereth him out of them all". (Phl.4:4) "Rejoice in the Lord always: again I will say, Rejoice". (Epe.5:20) "[G]iving thanks always for all things in the name of our Lord Jesus Christ to God, even the Father". (Jn.14:12) "Verily, verily, I say unto you, He that believeth on me, the works that I do shall he do also; and greater [works] than these shall he do; because I go unto the Father. (13) And whatsoever ye shall ask in my name, that will I do, that the Father may be glorified in the Son". Then I took my son intomy arms, and him and I took a bath, and rested. (Jn.11:40) "Jesus saith unto her, Said I not unto thee, that, if thou believedst, thou shouldest see the glory of God?" 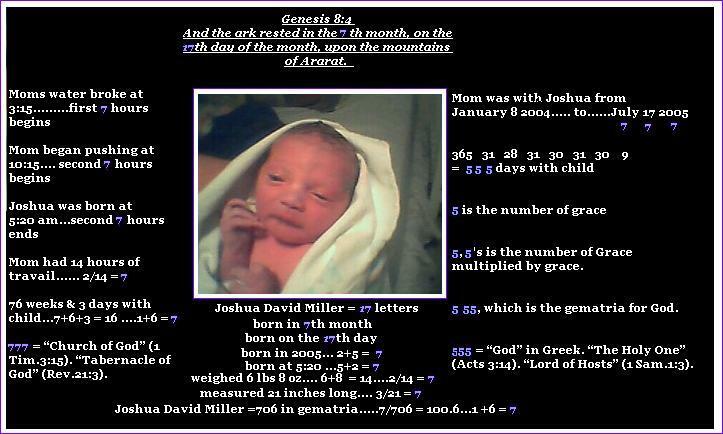 Joshua was born in the 7th month on the 17th day in 2005...2+5 =7. (Rom.1:17) "The righteous shall live by faith", for we have nothing that we did not receive from Him. (1 Cor.4:7) "For who maketh thee to differ? and what hast thou that thou didst not receive? but if thou didst receive it, why dost thou glory as if thou hadst not received it?" The last time I wrote to God's people on Sept. 12, 2004 my wife Martha was six (6) months' pregnant. Today, almost a year later, Sept. 5, 2005, she is now in her eighteenth (18th) month of pregnancy. It is a miracle. It is a sign. The Lord spoke to me in the Fall of 2003 and said, "The child is a sign of destruction, before the child is born there shall be destruction in America". This has been fulfilled as New Orleans, Mississippi, and Florida testify. Back in the Fall of 2004, God spoke to me that He was giving me three (3) signs. The first sign was the child, the sign of destruction before the birth. The second sign was that Florida would be ravished by the end of September 2004. The third sign was that Miami, Florida would be struck by a brutal blow from the hand of God. It would be overwhelming. Chaos, sorrow, devastation, death, destruction. He had me prophesy against the city. The first two signs have been fulfilled. Florida was ravished by hurricanes by the end of Sept. 2004. My wife is still with child today and destruction in America has happened in the form of Hurricane Katrina. New Orleans is gone. Mississippi destroyed. Soon Miami, Florida will be devastated. God has commanded me to warn all His people, "Leave Miami, Florida! Flee out of Miami! New Orleans is your example that God will make waste an entire city. Oh, people of God, hear the word of the Lord". And ye shall know that I, the Lord God, have brought this Judgment against thee. (Lk.13:4) "Or those eighteen, upon whom the tower in Siloam fell, and killed them, think ye that they were offenders above all the men that dwelt in Jerusalem? (5) I tell you, Nay: but, except ye repent, ye shall all likewise perish". (Lk.13:11) "And behold, a woman that had a spirit of infirmity eighteen years; and she was bowed together, and could in no wise lift herself up. (12) And when Jesus saw her, he called her, and said to her, Woman, thou art loosed from thine infirmity". Note from David: Since this man-child was named Joshua David, who were both types of the man-child, the 18-month pregnancy could show a slight delay in the birth of the man-child until a time of judgment and deliverance. This also could fit with the delay in a couple of judgments we have seen recently. Also this child is a Miller, which is one who prepares seed to be digested by men. Seed is the Word, according to Jesus. The man-child is going to be the greatest sower of seed in the hearts of men since Jesus spoke the parable of the sower.